Microsoft Forefront Identity Manager or Dirsync. Making websites in the Cloud on WindowsAzure in a few minutes. Using SQL databases for your on-premises applications or for your Cloud applications. Managing applications for mobile devices. To begin with private Cloud computing on-premises, you begin with architecture and design to match the business requirements. 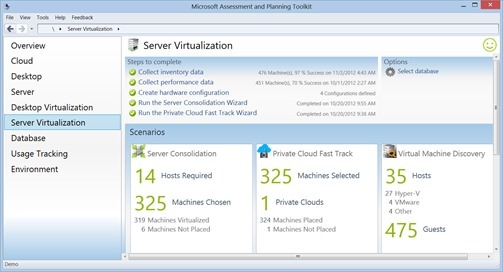 disaster recovery with System Center 2012 Data Protection Manager and Windows Azure Backup for your Private Cloud solution. Disclaimer: As with all Best Practices, not every recommendation can – or should – be applied. Best Practices are general guidelines, not hard, fast rules that must be followed. As such, you should carefully review each item to determine if it makes sense in your environment. If implementing one (or more) of these Best Practices seems sensible, great; if it doesn’t, simply ignore it. In other words, it’s up to you to decide if you should apply these in your setting. ⎕ Use Server Core, if possible, to reduce OS overhead, reduce potential attack surface, and to minimize reboots (due to fewer software updates). When the Hyper-V role is installed, the host OS becomes the “Parent Partition” (a quasi-virtual machine), and the Hypervisor partition is placed between the parent partition and the hardware. As a result, it is not recommended to install additional (non-Hyper-V and/or VDI related) roles. Additionally, when you use Cluster Shared Volumes, exclude the CSV path “C:\ClusterStorage” and all its subdirectories. Select “Microsoft Windows Server 2012 Hyper-V” from the Threshold file title, then choose Export to Perfmon template file. 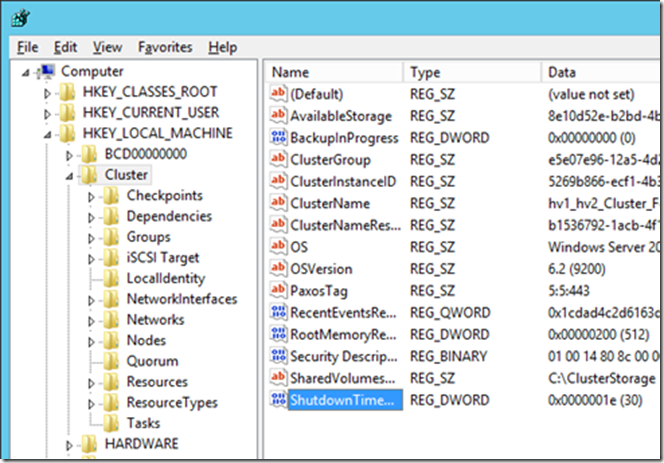 Save the XML file to a location accessible to the Hyper-V host. In Performance Monitor, click on Data Collector Sets –> User Defined. Right click on User Defined and choose New –> Data Collector Set. Name the collector set “Hyper-V Performance Counter Set” and select Create from a template (Recommended) then choose Next. On the next screen, select Browse and then locate the XML file you exported from the PAL application. Once done, this will show up in your User Defined Data Collector Sets. ⎕ Jumbo frames should be turned on and set for 9000 or 9014 (depending on your hardware) for CSV, iSCSI and Live Migration networks. This can significantly increase (6x increased throughput) throughput while also reducing CPU cycles. ⎕ Legacy Network Adapters (a.k.a. Emulated NIC drivers) should only be used for PXE booting a VM or when installing non-Hyper-V aware Guest operating systems. Hyper-V’s synthetic NICs (the default NIC selection; a.k.a. Synthetic NIC drivers) are far more efficient, due to using a dedicated VMBus to communicate between the virtual NIC and the physical NIC; as a result, there are reduced CPU cycles, as well as much lower hypervisor/guest transitions per operation. After this, you want to configure the NICs properly. 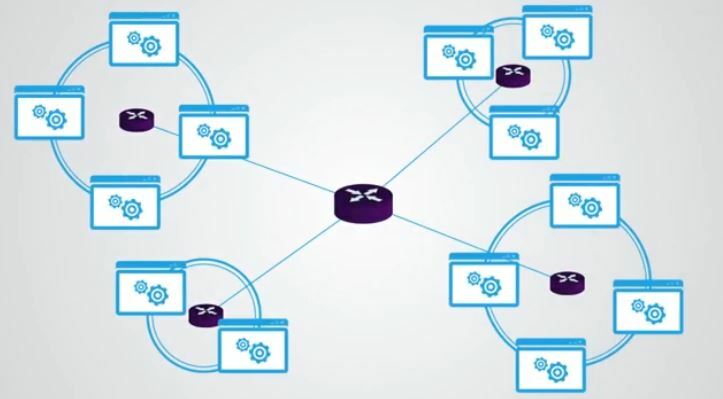 This will include setting IP addresses, creating separate subnets for each kind of traffic. You can optionally put them each on a different VLAN. ⎕ Disks should be fixed in a production environment, to increase disk throughput. Differencing and Dynamic disks are not recommended for production, due to increased disk read/write latency times (differencing/dynamic disks). Suggest setting the timeout to 15, 20 or 30 minutes, depending on the number of VMs in your environment. ⎕ If utilizing Hyper-V Replica, update inbound traffic on the firewall to allow TCP port ‘80’ and/or port ‘443’ traffic. (In Windows Firewall, enable “Hyper-V Replica HTTP Listener (TCP-In)” rule on each node of the cluster. Important: See “Use caution when using snapshots” under the Disk section for more information regarding snapshots. ⎕ Ensure Integration Services (IS) have been installed on all VMs. 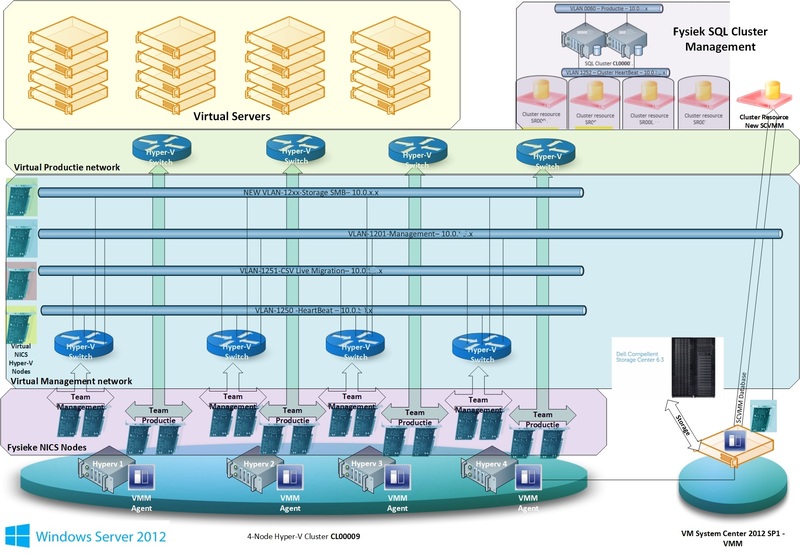 IC’s significantly improve interaction between the VM and the physical host. 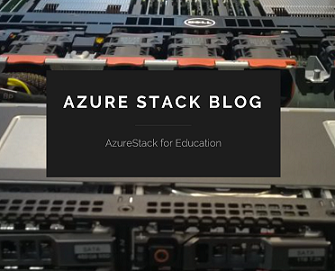 Categories: APP-V, Azure, Hyper-V, Office365, PowerShell, SCVMM 2012, System Center 2012 R2, System Center 2012 SP1, Windows Server 2012, Windows Server 2012 R2, WindowsAzure | Tags: ADFS, Cloud, CloudOS, HyperV, Office365, SCVMM, sysctr, WindowsAzure, winserv, ws2012 | Permalink. Microsoft_Assessment_and_Planning_Toolkit_Setup.exe. Installation package containing the tool and SQL LocalDB. Categories: Hyper-V, System Center 2012 SP1, Windows 8, Windows Server 2012, WindowsAzure | Tags: Cloud, HyperV, map, SQL, Windows, WindowsAzure, ws2012 | Permalink. 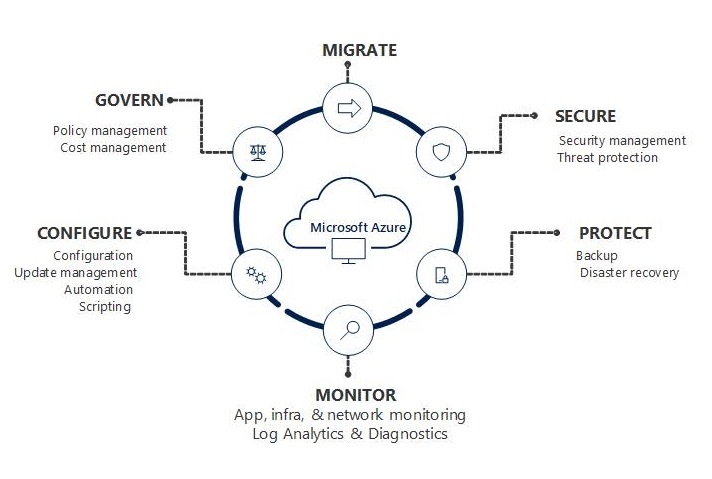 Experience the flexibility, automation and control delivered by Microsoft SDN solution by deploying Windows Server 2012 and System Center 2012 SP1 today. 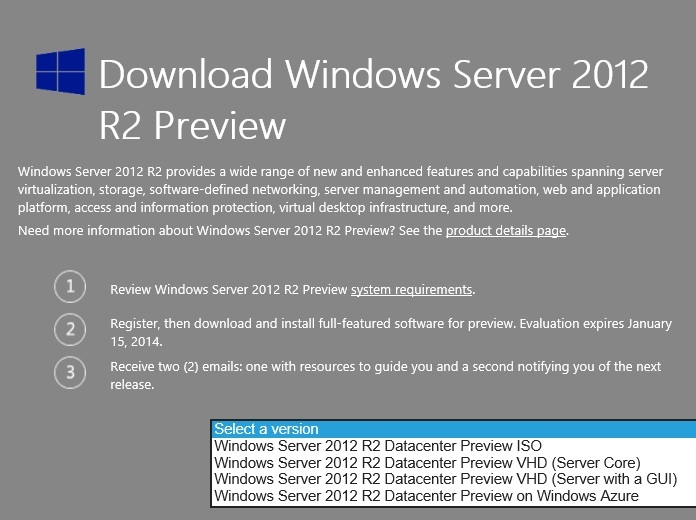 You can also evaluate our latest and greatest SDN capabilities by using the Windows Server 2012 R2 Preview and System Center 2012 R2 Preview bits that Microsoft announced this week. Categories: System Center 2012 SP1, Windows News, Windows Server 2012, WindowsAzure | Tags: HyperV, SCVMM, sysctr, WindowsAzure, winserv, ws2012 | Permalink. This AVMA key enables license activation for virtual machines based on the license state of the virtualization server (please see this whitepaper for more information). 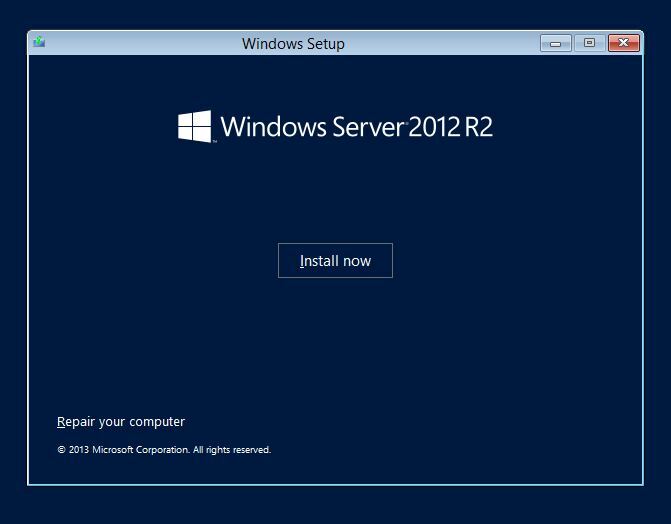 Access technical product resources—such as evaluation guides, virtual labs, training courses, and forums—at the Windows Server 2012 R2 Preview Resource Page. 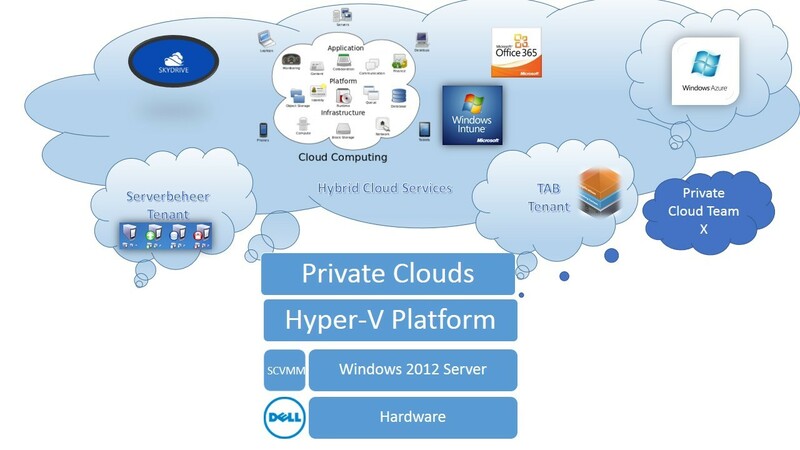 Categories: Hyper-V, Windows Server 2012 | Tags: Cloud, HyperV, WindowsAzure, winserv, ws2012 | Permalink. Categories: Hyper-V, LYNC, Office365, PowerShell, System Center 2012 SP1, Windows 8, Windows News, Windows Server 2012, WindowsAzure | Tags: Cloud, HyperV, sysctr, TEE13, WindowsAzure, ws2012 | Permalink. This document is to provides customers with the necessary guidance to deploy a Microsoft private cloud infrastructure in accordance with the IaaS PLA patterns that are identified for use with Windows Server 2012 and System Center 2012 Service Pack 1 (SP1). 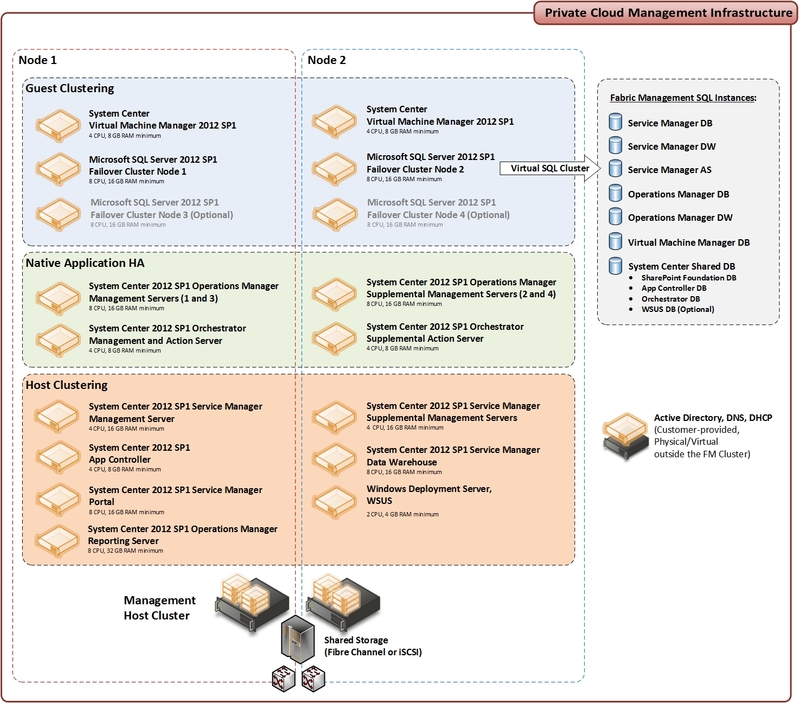 This document provides specific guidance for deploying a management architecture for an overall private cloud solution. Categories: Hyper-V, System Center 2012 SP1, Windows Server 2012 | Tags: HyperV, SCVMM, sysctr, ws2012 | Permalink. 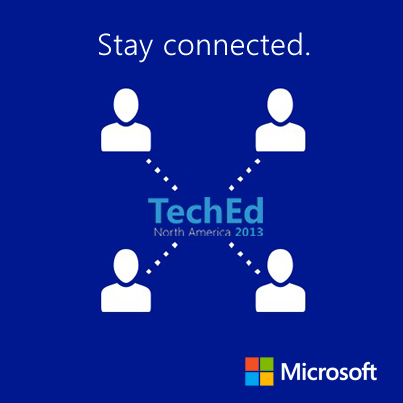 There’s no doubt that in June, Tech Ed North America and TechEd Europe are the places to be to get the greatest download of technical information and training out there. However, we know that not everybody can make it, but the good news is that even if you aren’t able to attend, you can still follow along and take part in the experience from the comfort of your own office, home, or even your datacenter! 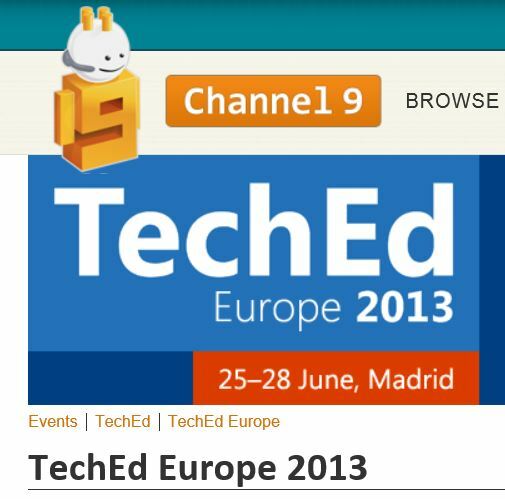 Categories: System Center 2012 SP1, Windows News | Tags: Cloud, HyperV, MSTechEd, sysctr, WindowsAzure, ws2012 | Permalink.